Padded clip sling for children with elephant pattern. 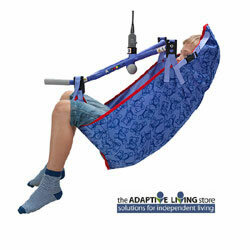 ArgoHuntleigh General Purpose Pediatric Sling has been designed with children in mind. The padding is positioned to provide extra comfort in the leg area and also helps to prevent the material roping and creasing under the legs. The sling’s polyester material has been specifically developed for pediatric patients. To enhance its appeal to children, the sling is decorated with a printed elephant pattern.